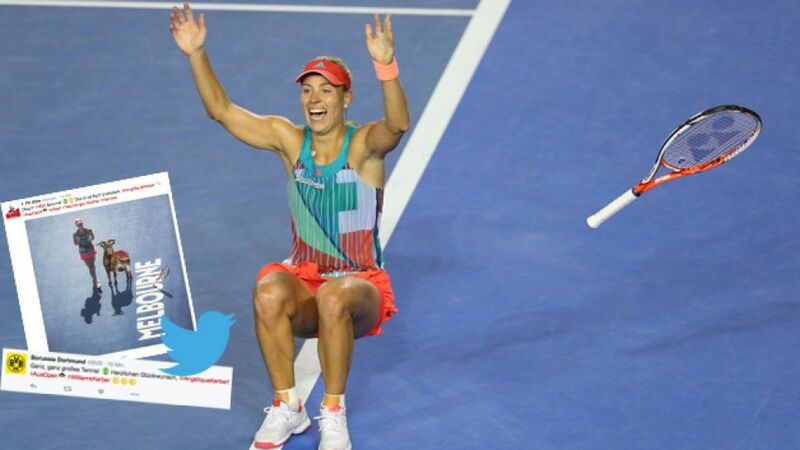 Bundesliga clubs and players have lavished congratulations on Angelique Kerber, who beat Serena Williams in Sunday's Australian Open final to become the first German to win a tennis Grand Slam since Steffi Graf in 1999. Kerber has long been a huge football fan. In an interview with bundesliga.de in 2013 she admitted she had been "a Bayern fan right form being a small child, despite coming from northern Germany. Everyone around us supported HSV or Bremen, so I was the odd one out." That passion still exists as Kerber revealed that "the tennis team I talk about football all the time, especially with Julia Görges and Andrea Petkovic." "FC Bayern congratulates you on your amazing triumph. Have a blast!" VfB Stuttgart tweeted "greaaaaaat tennis! Congratulations on your triumph! Amazing! White-and-red greetings from Stuttgart"
Players were quick to offer their congratulations as well. FC Bayern München star Mario Götze tweeted "One sporting highlight after another! Game, set and match. RESPECT! AMAZING!"